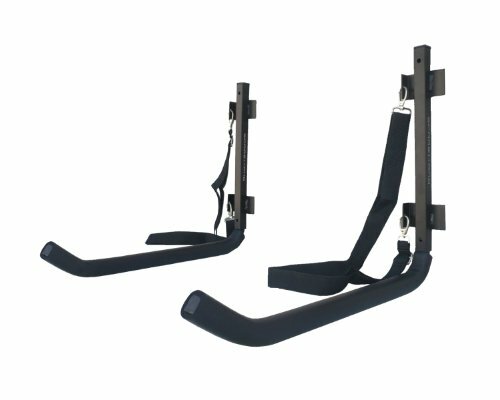 The stoneman sports KC-10 single kayak wall mount rack is a reliable way to hold your kayak in a stable position until you need your boat. Whether that's in the garage or in a storage shed, the single kayak wall mount rack is an excellent way to store your kayaks on the wall! from screws to straps, this product comes with everything you could possibly need to store your kayaks. Installation is easy! you will never again have to worry about people tripping over your boat, or even worse, damaging your gear. This product includes a one year warranty. Stoneman sports is dedicated to innovation and simplicity, and specializes in high-quality lifestyle and sports products. Their expansive product offering includes bike racks, kayak carriers, grilling accessories, and much more. Stoneman sports provides some of the most durable sports accessories at competitive prices, and has great ideas for real-life applications. If you have any questions about this product by Stoneman, contact us by completing and submitting the form below. If you are looking for a specif part number, please include it with your message.